NIA-CHARLESTOWN NEVIS (January 24, 2011) — Members of the Nevis public need not be afraid of the matter of confidentiality, when the 2011 Population and Housing Census commences in April. 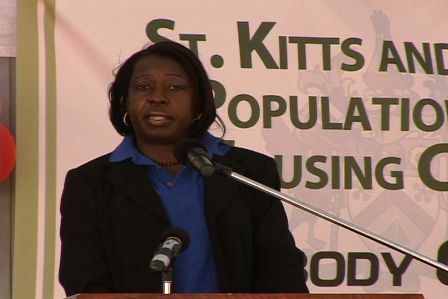 The assurance came from Director of Statistics and Economic Planning on St. Kitts Ms. Beverly Harris while she made a presentation at the official launch of the exercise at the Memorial Square in Charlestown on January 20th. “The Census will be conducted under the authority of the Statistical Act which requires everyone to respond. The Act prohibits the release of information about anyone to any agency. All data collected will be aggregated to avoid identification of persons. “Any census worker proven to have violated any of these rules governing confidentiality can be taken to court. Census workers will have to take an oath of secrecy. They will be trained on the importance of confidentiality,” she said. The census which will be conducted through to May 2011 will cover 13 general areas including migration, housing, crime, demographic characteristics, disability, birthplace, residence, education and training and vocational training. Some indicators to determine fertility rates such as marital status, fertility, economic activity and the places where persons spend the time that is the fixed reference period the census night would also be looked at. The area of education will be under scrutiny with regard to attendance at educational institutions, the highest level of education obtained, the quality qualification gained all of which could be cross tabulated by age, gender, location etc. “The information on education and training is also very important. The information helps us to project the number of school places required in the future, the size and location of future schools and the number of teachers that will be needed. How many pre schools will be needed for 2012/2013? This information will help us to make that decision. “At the same time we will be better able to project the number of persons leaving school in the next 10 years and estimate their demand for employment and the number of new jobs required over the next 10 years,” she said. According to Ms. Harris, the data collected during the last Population and Housing Censes on Nevis in 2001 revealed that the largest proportion of the population fell into the 5-14 year age group. They amounted to 18.4 percent of the population. In general the data indicated for Nevis that there was a very young population, with most persons within the 0-49 age group. The other important indicator which will be investigated will be housing in terms of quality and quantity. The information attained from the housing section, she explained, would help policy makers and private individuals better able to assess the housing situation in terms of the age and conditions of the existing stocks and the level of overcrowding in some of these homes. “It is necessary that we assess the housing stock that exists in Nevis in terms of the quality and quantity. It is also important to measure the conditions under which persons live. In effect the demand for housing in the future will not only be able to be provided at the parish level but at the community level. The census will obtain data on the supply of housing units, the structural characteristics and the facilities used by the household. Data on the homeless persons will also be collected,” Ms. Harris said. Meantime, the St. Kitts Director of Statistics and Economic Planning gave a behind the scenes insight into the workings of the Census. She noted that it would involve enumeration of all persons in all parishes within Nevis. They would be divided into Enumeration Districts (ED) and one enumerator will be assigned to each district. At present there are 50 EDs in Nevis it is expected that each ED will contain less than 100 households. Census Day is slated for May 2011. “Field enumeration will begin in April and will take around four to six weeks, all localities will be covered. In areas that prove difficult to contact, we would appeal to householders to come to the office to be enumerated. The data we collect will then be aggregated at the parish level, at the district level and at specific village levels. “In recent years, the last level of aggregation has become increasingly important to policy makers, researchers, politicians and students within small areas rather than at the parish or wider community level. This is important as the data collected can be used to produce statistics in geographical units,” she said. In conclusion, Ms. Harris thanked everyone ahead of their support of the census as she underscored the importance of participation. “It is important for all of us to play our part in supplying the data needed for planning, for targeting and for making business and personal decisions. Remember it goes beyond the numbers. It is data for our future and everyone counts,” she said.